More and more collections are being digitised and images of books, illustrations, and art works become freely available to a large audience. They are picked up and posted on Pinterest, Instagram, and what have you. 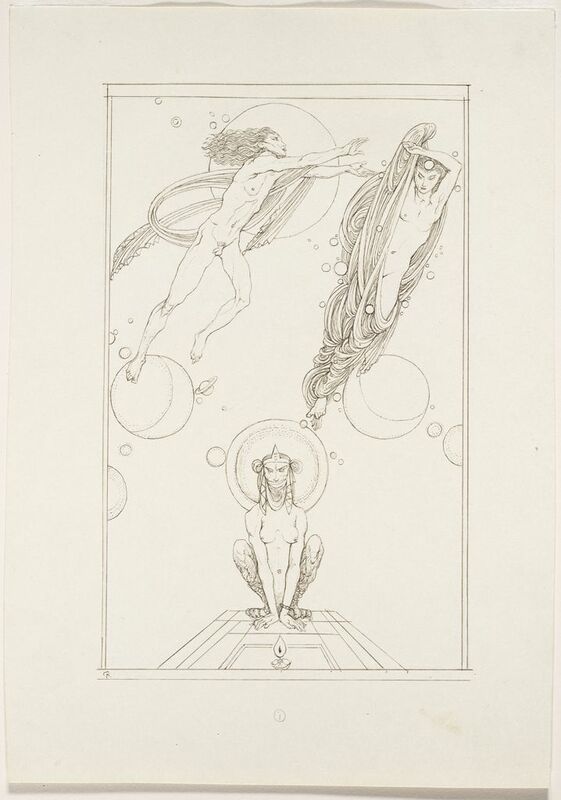 The Harvard Art Museums currently shows 14 works online: stage designs, costume drawings, and book illustrations, among them is the series of drawings for a projected but unpublished edition of Oscar Wilde's The Sphinx. One of the drawings in brown ink over graphite on cream wove paper (30,1 x 21 cm) depicts the sphinx with images of a naked man and woman. The series of illustrations was sold by Scott & Fowles in New York (through Martin Birnbaum) in 1923 to Grenville L. Winthrop, who donated the works to Fogg Art Museum of Harvard University in 1942 as part of his art collection. Grenville Lindall Winthrop (1864-1943), a lawyer, assembled his collection in an Upper East Side townhouse in New York. The Ricketts drawings found themselves in the company of some 4000 other works of art, including paintings and drawings by William Blake, Edward Burne-Jones, Ingres, Daumier, Van Gogh, Whistler, Moreau, Delacroix, and Beardsley. Not bad company at all.